Low density polyethylene/ EVA copolymer with other materials and additives that provide to the film many properties. Poly Film coverings are available in several grades of quality and several different materials. Poly film costs are very low because the frame can be lighter and plastic film is inexpensive. Light transmission of these Poly Film coverings is comparable to glass. 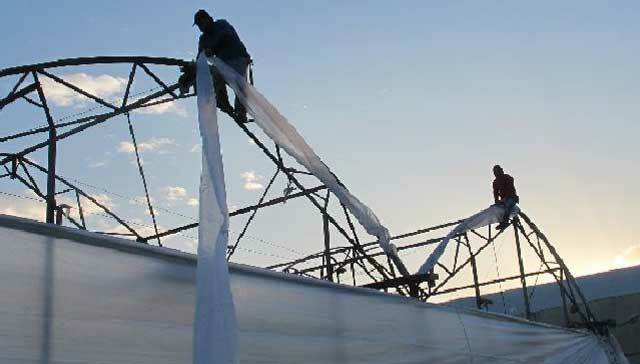 Solar- Ice Cooling Poly Film:Greenhouse owners have long contended with the loss of heat from greenhouses during the night and at times of cool weather. That is why high level of thermicity of Solar-Ice is so important. Research conducted in Europe shows that, in greenhouses covered with Solar-Ice, the total solar heat load was reduced by over 20%, without any significant decrease in PAR light. Tufflite Poly Films:Tufflite is the original "colorless" polyethylene greenhouse covering. For over twenty years, growers have covered their income (crops) with Tufflite. Tufflite was the first multi-year product incorporating the HALS Formula System (Hindered Amine Light Stabilizer) of ultraviolet inhibitors. 6 mil extrusion laminated reinforced film is made of two layers of linear low density polyethylene (LLDPE) and one layer of polyester string reinforcement scrim. Black Out Light Deprivation Tarp an 8 mil Black/White string reinforced polyethylene film manufactured with a mix of virgin polyethylene resins. The white outer layer contains UV inhibitors and thermal stabilizers to reduce heat build-up as well as condensation and the black outer layer contains carbon black to enhance outdoor life and ensure total light deprivation. SolaWrap Covering saves more energy with its unique design feature, and provides an insulating effect that retains up to 95% of heat radiation while providing an impresive R-value of 1.7! .